It might seem a critic’s cliché to begin a review by describing such a well-known writer as neglected, but among Indian literary and cultural figures, Adil Jussawalla, until recently, was neglected by scholars, critics and award-granting bodies. There are no introductory books, volumes of explication, or anthologies of literary criticism such as exist for Nissim Ezekiel, Kamala Das, Keki N Daruwalla, or, more recently, Arun Kolatkar. The tide began to turn in 2014 with the Sahitya Akademi award for Trying to Say Goodbye, followed by an excellent essay surveying his work by the French critic Laetitia Zecchini in Rosinka Chaudhuri’s History of Indian Poetry in English. (2016). 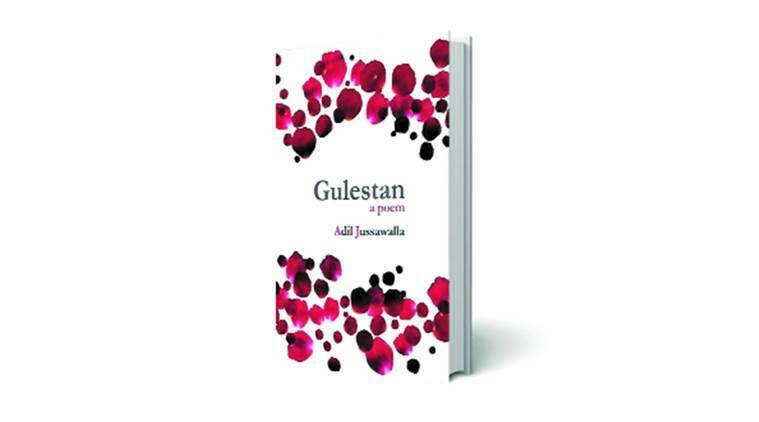 Gulestan, a not-so-long ten-part poem, is part of an extraordinary late outburst of publications of volumes of poetry and prose by someone who for decades, apparently, had devoted himself to journalism, editing and publishing others — during the many years between Missing Person (1976) and Trying to Say Goodbye (2011). Jussawalla has always been unlike poets like Nissim Ezekiel, Keki Daruwalla, Eunice De Souza, Kamala Das and Dom Moraes, in the obliqueness, intensity, and difficulty of his verse. Rather than conversing, he can be vatic, highly lyrical, organising the fragments, images and emotions in his poems more by themes than sustained discussion. The result is deeper, yet somewhat puzzling and vague. The interpretation of Gulestan is helped by introductory and closing notes informing the reader that the poem was begun during the 2006 attack on Mumbai, when Jussawalla was turning 70, and that the concluding words of the poem constitute “the first of the one hundred and one names of God in Zoroastrian scripture”. This is a poem about the disenchantment of ageing, loss of belief and fear of approaching death, coinciding with the murderous attack on the city where Jussawalla lives and has long been at home. While loss of religious belief and alienation have been Jussawalla’s themes over the decades, the poetry here is unusually musical. His late poems are more than a summation of past work. There is a confidence, personality, and unique voice finding expression in the thought and experience. Although I am unfamiliar with it, Zoroastrian scripture seems similar to the Jewish, Christian, and Muslim traditions. Gulestan uses the loss of Paradise and the building of the Tower of Babel to imply analogies between the mythological, personal and present. The lost paradisiacal garden of Gulestan is the belief of childhood, “Is she something I saw in a picturebook/ (each rose in her body housed in a flame)?”; loss of belief is linked to ageing; “I insist there were many rose trees./Each stood for a lost year”. The fall from paradise and the building of the Tower of Babel is also the start of racism, and religious hatred, whether Muslim/Hindu or Aryan/Jew. A short review is no place to explicate a complex poem in which the themes need space to demonstrate how and why they are linked, but it should be obvious without further quotations that this is a powerful, intense, important poem, sometimes sardonic, at times ironic, in places confessional, and a major work of literature, that demands attention while being a pleasure to read, especially aloud for its music. The puzzling symbolism can usually be understood in context; if not, Google is useful. It is lyrical yet evocative of the public and mythic as well as the personal. After Gulestan, Jussawalla should no longer be neglected. He is back better than ever.